DW05 Series | Japan Aviation Electronics Industry, Ltd. Along with the spread of energy management systems in recent years, the introduction of storage battery system using lithium-ion is becoming widespread. As for the systems like storage battery one using high current, the importance is attached to the safety at the time of assembly work and maintenance. So there are a lot of demands for connection methods that can prevent incorrect wiring and short circuit accidents. 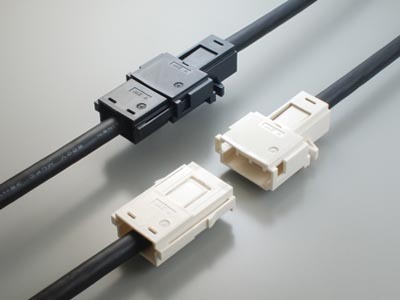 JAE has now developed the 150A-class high-current connector DW05 Series which can realize a safe connection in the situation using such high current. The contacts of the DW05 Series cannot be touched easily, and from the difference in the mating shape, the connection between the opposite polarities cannot be made. So it is possible to prevent short circuit accidents between the opposite polarities and realize a high level safety. Also, it contributes to shorten work time for customers by simplifying connection work with an easy operation lock structure equipped between the connectors, which can provide adequate strength as well as screw fixing. The DW05 Series features a multi-contact structure compatible with high-current connection and also has superior connection stability. Improved Workability: With mis-mating prevention key to avoid wrong wiring and short-circuit during assembly. Mis-connection of positive and negative polarity terminals prevented by using 2 different colors for insulator (ivory and black), and a different mating shape for each. High Safety: With structure to prevent finger tips from touching the terminal to avoid electrical shock. Termination: Crimp termination considering on-site assembly.